Discs, abrasive discs, hook and loop discs, PSA discs, quick-change discs, resin fiber discs, surface conditioning discs diamond coated discs, carbide grit discs. 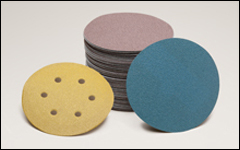 Abrasive discs used for general surface preparation, grinding, shaping and cutting. PSA discs are pressure sensitive adhesive discs are available with durable aluminum oxide bonded to a cloth, paper or tear-resistant film backing. For use on ferrous and non-ferrous metal sanding as well as wood, plastic, and composites. 3" to 8" diameter with 24 to 2000 grit. 5" 100 grit discs: 18¢ ea (gold paper), 23¢ ea (red paper), 40¢ ea (film) and 58¢ ea (cloth). Choose Gold paper PSA discs , Red paper PSA discs , Film PSA discs , or Cloth PSA discs . Hook and loop discs are available with the finest quality aluminum oxide bonded to paper or tear-resistant film backing. Designed for sanding wood, ferrous and non-ferrous metals, paint, fiberglass, and plastic. 3" to 8" diameter with 80-2000 grit. 5" 100 grit discs: 28¢ ea (gold paper), 28¢ ea (red paper) and 44¢ ea (film). Choose Gold paper hook and loop discs , Red paper hook and loop discs , or Film hook and loop discs . Quick-change discs are available with either aluminum oxide, zirconia alumina or silicon carbide abrasive grit. Surface conditioning discs have a similar type of material to Scotch-Brite™ or Fibrex discs. Available with Type R or Type S attachements and are used frequently used in deburring, surface preparation and as a final finishing step. 2" and 3" diameter with 24 to 320 grit. Choose 2" and 3" quick-change discs or Surface conditioning discs . 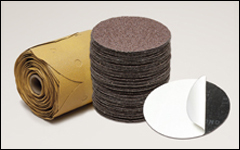 Heavy-duty sanding discs are available in a variety of materials including aluminum oxide, zirconia alumina, carbide grit or diamond. Camel and ZEC discs are also included. These heavier duty discs can be used for non-ferrous materials such as fiberglass, marble, enamels, porcelain, China clay, and for removing epoxy, glue or urethane. 4" to 7" diameter with a wide range of grit options. Choose Resin fiber discs , Resin fiber discs, heavy-duty , or Carbide and diamond discs .